I am blessed with fun, creative friends – yes, I am grateful for such an Entwined Life! So as I sit working on several stories at once – on this “iced in” day from the east coast, I saw a fun post from my dear friend of 35 years, come across my screen from the west coast. 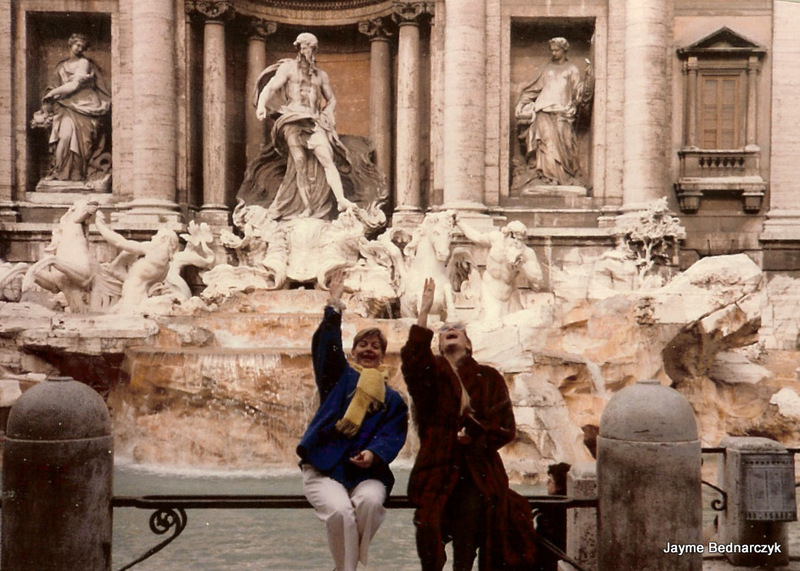 Jayme & Martha – throwing 3 coins in Trevi Fountain. 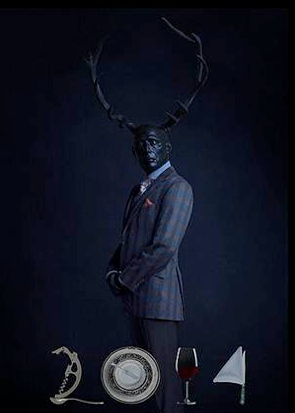 one of Hannibal’s Executive Producers. 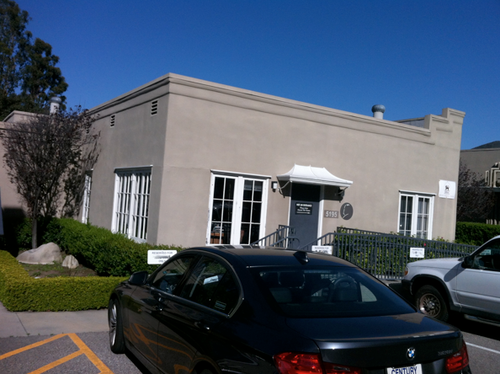 My production shingle, the De Laurentiis Company, is located perfectly in the middle of the NBC Universal lot, in the Alfred Hitchcock Bungalow on James Stewart Drive. 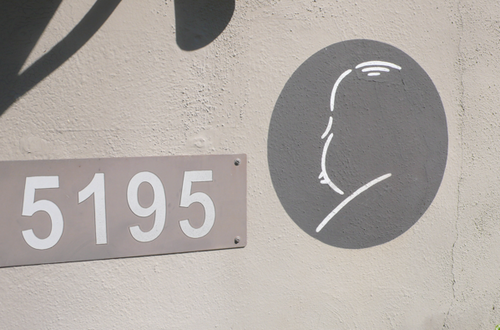 From these offices, Hitchcock planned some of film’s greatest thrillers, including Psycho and The Birds, as well as his television series, Alfred Hitchcock Presents, which filmed on the lot 1955 1965. Executive producer Bryan Fuller and the Hannibal writers room joined us in these hallowed halls as the show started ramping up two years ago, and out of respect, Bryan brought in his art quality collection of framed Hitchcock posters. Of all the Hollywood studios and television lots, only the NBC Universal lot is open to the public, via a tram-based tour that starts from the theme park. The Universal Tour Tram memorializes the master of suspense by playing the Alfred Hitchcock Presents theme music as it passes, and we often hear tour guides talking about the bungalow and its history as we’re going to or coming from our cars. 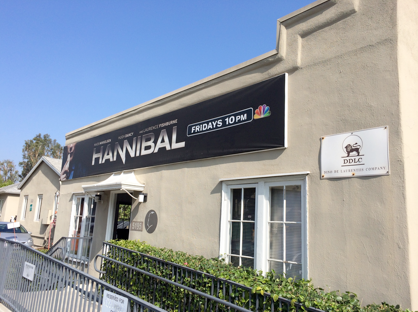 Thinking that tourists might also appreciate the fact that a groundbreaking new suspenseful television series was being hatched in the same offices that housed Hitchcock, I set out to discover how we might get Hannibal included on the Universal Studios Tour. The Director of the Studio Tour department, Mike Sington, put the kibosh on the beer – too many ironclad rules and regulations around studio liability – but he was completely on board with the idea of hosting the guides in the bungalow. On the tours, the guides describe the projects currently shooting on the lot, but apparently no one had thought to bring them into their offices or sets before. The Universal tour guides tend to be major classic film buffs, and once inside, their enthusiasm was contagious. 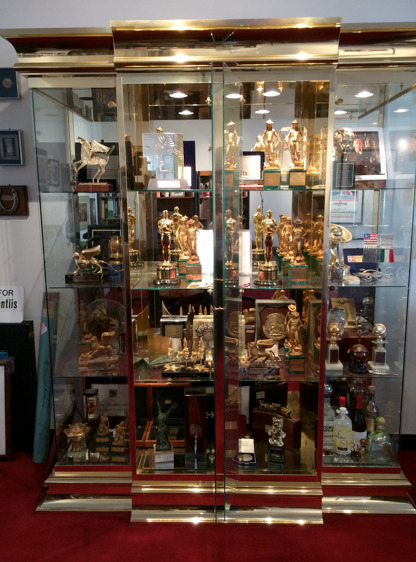 None of Hitchcock’s original furniture or effects remain, but I invited them into his office, opened Dino’s award case and passed around some Oscars for selfies. Mike agreed to host a short video clip on the trams as they passed by the bungalow as well as a blurb about the show. We chose the “Ring Ring” clip, which teases the show’s tone. 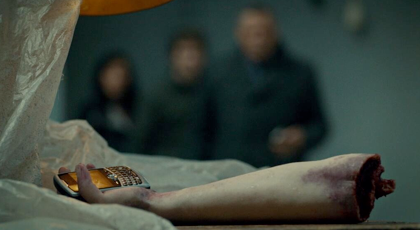 To the accompaniment of the Goldberg Variations (synonymous to all things HANNIBAL), the camera pans over FBI trainee Miriam Lass’s severed arm holding a ringing Blackberry (rewatch episode 106 Entree if you don’t remember! ), as Jack Crawford and Will Graham enter frame with a WTF expression. Cut. It’s the perfect length for the approach to the bungalow, giving the guides enough time for a short shout-out for the show. My neighbors next door are the production arm of the game company Hasbro, behind films like Transformers and Battleship. In front of their bungalow, a giant Mr. 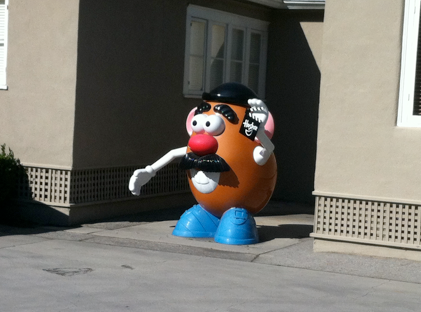 Potato Head stands with his arms splayed, holding up the Hasbro sign. Tourists snap snap snap their cameras all day long grabbing pics of Mr. Potato Head. I had an outré idea… and I was excited when my friends at Hasbro liked it. With the help of my friend Mike Filonczuk, we made a duplicate of Mr. Potato Head’s arm to scale and mounted it on a prop box. Then, we took a can of epoxy red paint and went to town, making it look like it had been brutally severed and was still dripping fresh blood. Echoing the iconic Miriam Lass image, we placed a Blackberry in the hand, as if in his last moments, Mr. Potato Head had been desperately calling out for help (#HelpMrPotatoHead). 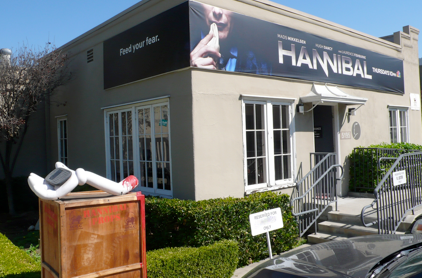 Then, suggesting a killer had been making mayhem on the lot, we displayed it in front of our bungalow, under the new Hannibal banner. Since then, hundreds of thousands of tourists have gone by. It was an especially big hit during the entire month of October when Universal Studios Hollywood celebrates Halloween Nights, staying open late into the wee hours. Also for October, we decorated the bungalow with a backlit life-size transparency of the Hannibal Wendigo out of the corner office. To simulate mysterious doings going on inside, we projected a short clip of the Wendigo emerging from the river, from upcoming episode 202. The guides loved this because we were the only interactive bungalow on the tour – at least besides what they stage on the backlot! A few weeks ago, I had the opportunity to meet again with the guides and give them insight into Season 2 and the progress of the writers’ room. We screened the first two episodes we’d just finished for them so they have the inside scoop on the series and can drop hints about it on their tours. After almost a year, we’ve updated the teaser and supplied a new shout-out script. It’s a bit of a relief inside the bungalow to no longer hear the “ring ring” every five minutes, but we do miss the audio cue that the trams are approaching. I am incredibly grateful for my friendship with Mike Sington and his wonderful and supportive guides’ role in sharing the excitement we all have for Hannibal. Now that the guides know me, they’ll often say hello when I’m out. On the loudspeaker, in front of the entire tram of tourists. It makes the lot seem friendlier and serves as a humbling reminder of all the love we’ve had from the fans. The new season began last Friday at 10/9c. Thirteen new spellbinding episodes are coming your way! We hope the master would think we’re making good use of his bungalow. Enjoy the season as we’ve all enjoyed bringing them to you! P.S. 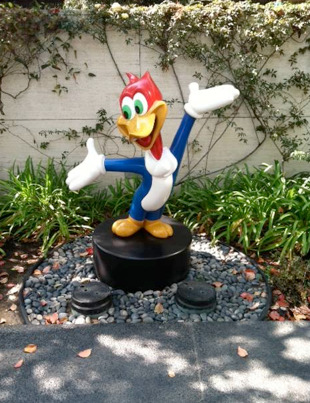 I saw a certain famous woodpecker outside the NBCUniversal offices. You’re next, Woody! Watch Out Woody, and don’t forget to take a bite out of the new season of Hannibal on NBC!